Jane Eppel is a South African printmaker based in the Cape Peninsula, the smallest yet richest of the world's six Floral Kingdoms. Inspired by nature, her work focuses on the abundance and diversity which daily surrounds her. 'Namesake' is Eppel's latest offering of etchings: a contemporary interpretation of the traditional genre of botanical art. These ten copperplate etchings are intricately detailed studies of local daisies – depicted singly, in sequence, or knotted into suggestions of further shapes and signs. 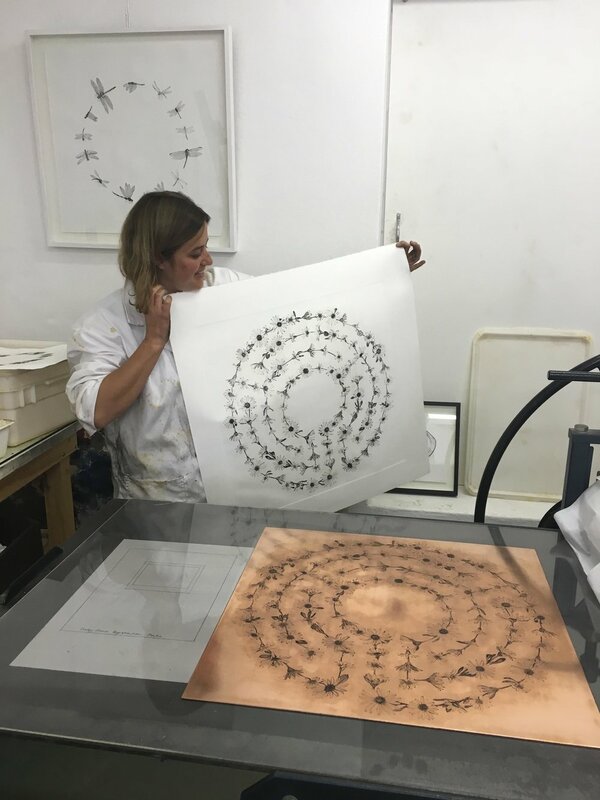 The quietness of the works belies the physical rigour of their making: copperplate etching is a very laborious process; from preparing the sheets of copper to finally etching the needle-drawn lines in ferric chloride, a work can take Eppel weeks and even months to complete. Though true to the ready familiarity of its subject matter, Eppel's flowers are not indebted to the conventions of photorealism: they operate as a form of storying, each of the works taking its place within a series of interlinked points, stages and movements. The artist’s eye is an obsessive one, probing the sensitivity of every stigma and stamen and matching their specificity with the exactness of her incisions. Yet the micro gives way to the macro and some of the flowers allude to seemingly more remote forms – to the imagined lines of a constellation and the orbital planes of a planet or, conversely, to the smallest unit of an atom or the bonds of a molecule. Eppel’s latest etchings will be exhibited in London at Everard London, from 27th April - 29th May 2018. (80 Fulham Road London, SW3 6HR +44 (0)20 7590 9991). She will exhibit alongside her husband, South African artist Nic Bladen, who is known for his extraordinary cast botanical sculptures.